Dr. Frank posted a comment and asking the following question, i once heard that the geeta has some verses mentioning the arrival of a messiah from the land-of-sands....is it true? Does the Gita really signals the forthcoming of Muhammad (peace)? Actually Hindu scriptures contains a number of Prophecy about coming of Muhammad, the Last Messenger (never the less, Jesus will have second coming before the Judgement Day, but Jesus is not the last Prophet because his Prophetic mission dated before that of Muhammad). The scripture that contains those great prophecies are Bhavishya Purana, Atharvaveda, Rigveda and Samveda. For example, According to Bhavishya Purana in the Prati Sarag Parv III Khand 3 Adhay 3 Shloka 5 to 8:: "A malecha (belonging to a foreign country and speaking a foreign language) spiritual teacher will appear with his companions. His name will be Mohammad. Raja (Bhoj) after giving this Maha Dev Arab (of angelic disposition) a bath in the Panchgavya and the Ganga water (i.e. purifying him of all sins) offered him the present of his sincere devotion and showing him all reverence said, "I make obeisance to thee. O ye! The pride of mankind, the dweller in Arabia, Ye have collected a great force to kill the Devil and you yourself have been protected from the malecha opponents." The Prophecy clearly states: The name of the Prophet as Mohammad. > He will belong to Arabia. The Sanskrit word Marusthal means a sandy track of land or a desert. > Special mention is made of the companions of the Prophet, i.e. the Sahabas. No other Prophet had as many companions as Prophet Muhammad (pbuh). 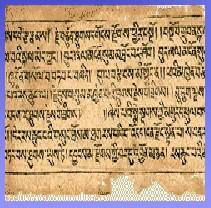 > He is referred as the pride of mankind (Parbatis nath). > He will kill the devil, i.e. abolish idol worship and all sorts of vices. > The Prophet will be given protection against his enemy. 1. Prophet Muhammad in Hindu Scriptures by Zakir Naik. 4. Prophecy about Muhammad in all world religion scriptures including Old and New Testaments. 5. A great analysis of Muhammad in Bible. What all Christians and Jews MUST know about the Bible. Tag: Prophecy, Muhammad, Hindu, Veda, Bible.